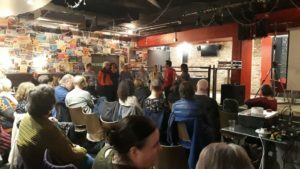 Six­ty peo­ple crowd­ed into Jim’s Bar in the QM Union at Glas­gow Uni­ver­si­ty on Feb­ru­ary 22 for the pre­miere of “Our Voic­es Resound” — Eileen Karmy and Mar­tin Farias’s won­der­ful film about Protest in Har­mo­ny and the pow­er and prac­tice of polit­i­cal song. The launch was spon­sored by the Alis­tair Hulett Memo­r­i­al Trust and organ­ised by the Janey Buchan Polit­i­cal Song Col­lec­tion. It was great to see such an enthu­si­as­tic recep­tion for the film when Eileen and Mar­tin field­ed ques­tions at the end of the show­ing. 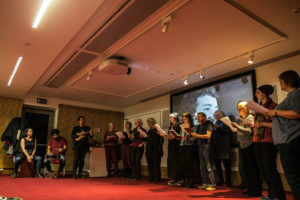 Eight mem­bers of the choir trav­elled through to Glas­gow to join the occa­sion and were invit­ed to sing the Free­dom Come All Ye, iden­ti­fied and filmed by Eileen and Mar­tin as our theme song, and to lead every­one in We Shall Over­come. We were very grate­ful and proud to be part of it. Eileen and Mar­tin are keen for a wider audi­ence for the film and invite us all to con­tact them for fur­ther show­ings. They intend to sub­ti­tle it in Span­ish (good luck with that for Free­dom Come All Ye!) and show it in their native Chile one day. 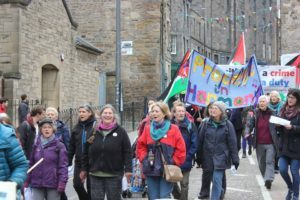 A great turnout from Protest in Har­mo­ny sup­port­ed the Pales­tine sol­i­dar­i­ty choir San Ghan­ny in Rose Street as part of the Inter­na­tion­al ‘Open Shuha­da Street’ cam­paign. Beside a mock ‘check­point’ many singers joined in a sim­u­lat­ed con­fronta­tion of Pales­tini­ans and Israeli sol­diers at Shuha­da Street in Hebron. Shuha­da Street epit­o­mis­es Israel’s apartheid pol­i­cy as Pales­tini­ans are not allowed to walk on it even if they live there, while Israeli set­tlers, sol­diers and inter­na­tion­al vis­i­tors may pass freely. 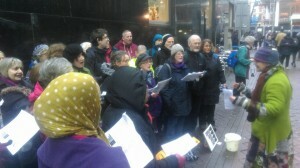 Oth­er Pales­tine sol­i­dar­i­ty organ­i­sa­tions helped by hand­ing out leaflets as PIH sang Pen­ny Stone’s song ‘Open Shuha­da Street’ and sev­er­al oth­er songs. The event was eye-catch­ing and some inter­est­ing and some chal­leng­ing con­ver­sa­tions took place with passers-by. A short video was sent to friends in Pales­tine in sol­i­dar­i­ty – and was much appre­ci­at­ed by them: Open Shuha­da Action 2019. Feel free to watch it and pass it on. 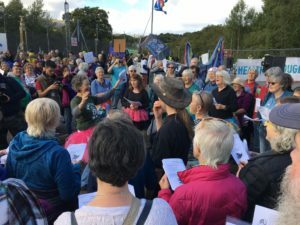 Anti-nuclear groups from all over Britain joined rep­re­sen­ta­tives from a num­ber of coun­tries to gath­er at Faslane on 22 Sep­tem­ber 2018. There was a very good rea­son to come togeth­er to cel­e­brate the award of the 2017 Nobel Peace Prize to ICAN (Inter­na­tion­al Cam­paign to Abol­ish Nuclear Weapons). 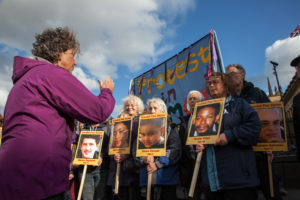 And as long-term cam­paign­ers, Protest in Har­mo­ny was there! Jane Lewis had writ­ten a new song for us, set to Offenbach’s Can-Can and had some­how per­suad­ed at least ten of us to make and mod­el very fetch­ing tutus. Anoth­er fif­teen choir mem­bers lent joy­ful sup­port. 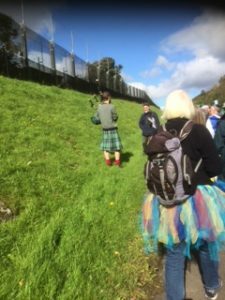 A large green Nessie and a ten-foot pup­pet of “Craig” led about a thou­sand of us to the North gate. 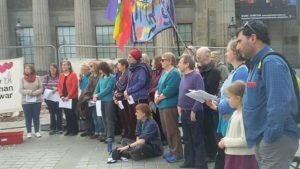 Jane, our ban­ner and the choir were to the fore while Pen­ny and Shereen sta­tioned them­selves along our col­umn to keep us all in time and tune. A piper accom­pa­nied us on the “Free­dom Come All Ye”. We were a colour­ful riv­er of life snaking round the grey base which was life­less except for the sound of dogs bark­ing. It was a won­der­ful cel­e­bra­tion and if it weren’t that we’re a non-vio­lent bunch you’d want to say we’d punched above our weight. Jack­ie Kay spoke, sup­port­ed by won­der­ful peo­ple from Israel, Rus­sia and Roma­nia, Japan and the USA all prais­ing Scotland’s long wit­ness against the weapons. We danced our can-can and sang our peace songs. 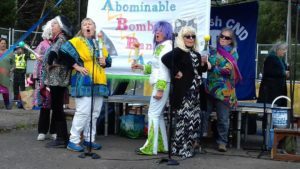 Pen­ny, Sylvia and Eileen sang solos and Abba (Mar­garet and Sheila in gob­s­mack­ing dis­guise with their friends from the Glas­gow Hor­ti­cul­tur­al­ists) begged us to “Take a Chance on Peace”. 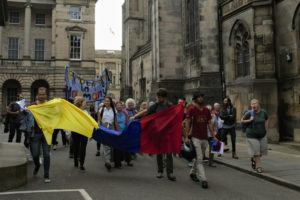 On Fri­day 28th Sep­tem­ber, PiH mem­bers attend­ed an event organ­ised by the Chilean Soci­ety of the Uni­ver­si­ty of Edin­burgh, and sang El Pueblo Unido. 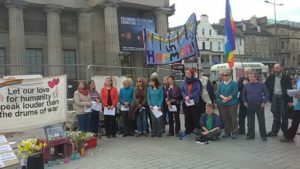 PiH mem­bers singing El Pueblo Unido. 11th Sep­tem­ber was the 45th anniver­sary of the coup d’état in Chile that over­threw Allende’s Pop­u­lar Gov­ern­ment (1970–1973). Through short films, pho­tog­ra­phy, and music made at the time, the event was designed to fos­ter con­ver­sa­tion about the dif­fer­ent projects that aimed to fol­low a demo­c­ra­t­ic path to social­ism in Chile, and beyond the speci­fici­ties of the Chilean case, to be a direct invi­ta­tion to bring peo­ple togeth­er and to acknowl­edge that pos­i­tive social change is pos­si­ble. On the evening of Sat 7 August, PiH singers joined the demon­stra­tion in West Par­lia­ment Square in sup­port of the Colom­bian peace agree­ment, in recog­ni­tion of the assas­si­na­tion of more than 220 lead­ers since the begin­ning of the imple­men­ta­tion of the Peace Agree­ment between the Nation­al Gov­ern­ment and the FARC-EP in Decem­ber 2016. 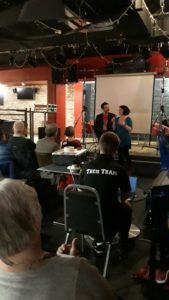 A small but deter­mined and tune­ful con­tin­gent made it to Brighton, along with some 30 oth­er choirs from across the UK, on a blis­ter­ing­ly hot week­end. The pic­ture shows us at the evening con­cert singing (and act­ing out) “Ye’ll No Sit Here”. 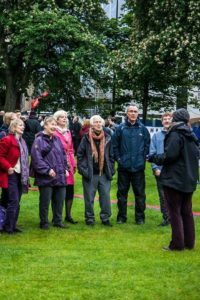 Ear­ly evening on 14 June 2018, 200 peo­ple gath­ered at the Mound precinct in Edin­burgh to join with oth­ers through­out the UK to mark the first anniver­sary of the Gren­fell fire. 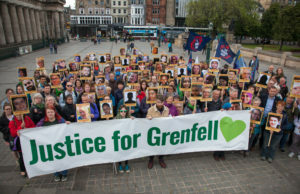 Large pic­tures of each of the vic­tims of that tragedy were held by peo­ple lin­ing Princes Street in silent vig­il for 30 min­utes. 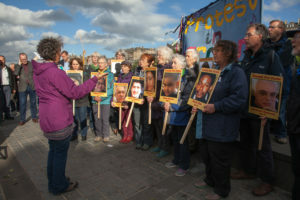 This was fol­lowed by: a state­ment from Jus­tice for Gren­fell read by Ali­son Mur­phy of the Edu­ca­tion­al Insti­tute of Scot­land; songs from Protest in Har­mo­ny; short speech­es from Leigh Craven, Liv­ing Rent, Heather Ford, Edin­burgh Ten­ants Fed­er­a­tion, Neil Find­lay MSP and John McKen­zie of the Fire Brigades Union. 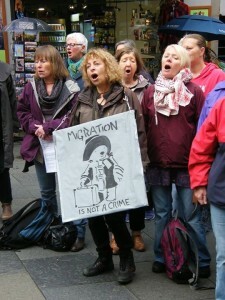 The mov­ing event was closed with a final poem read by Mary Alexan­der of Unite. 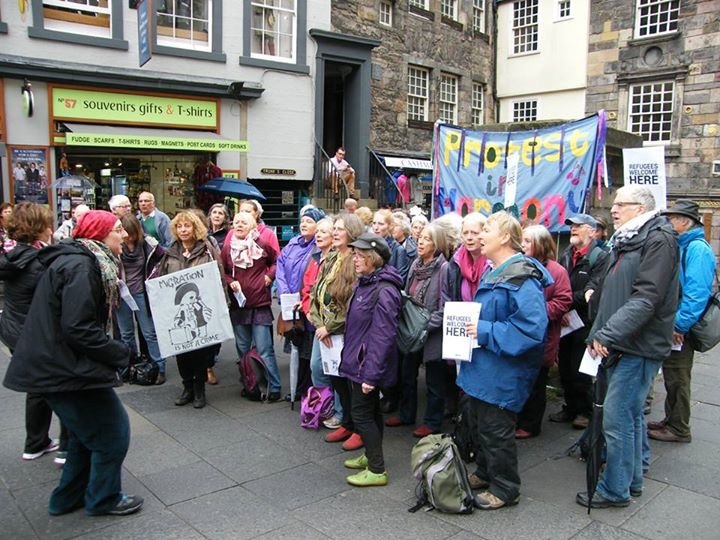 After our month­ly meet­ing on 17th March a large num­ber of us gath­ered in the High Street in Edin­burgh to sing. Eileen filmed us. A lot of peo­ple seemed stop and lis­ten. 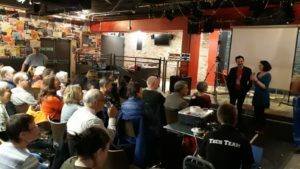 It was real­ly suc­cess­ful, with quite a few new mem­bers com­ing along. 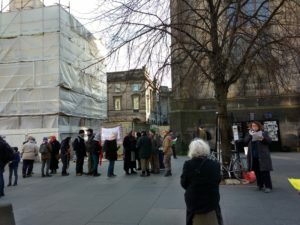 Near­ly every­one then went to George Square with Shereen to sing and sup­port a group of stu­dents who were demon­strat­ing there in sup­port of the lec­tur­ers’ strike. 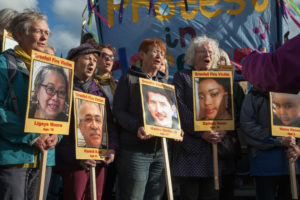 On Feb­ru­ary 24th the High Street was busy with peo­ple on their way to the Rug­by Inter­na­tion­al against Eng­land. 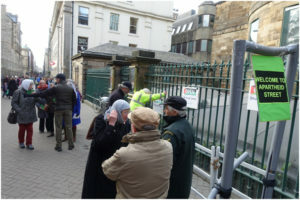 So, set­ting up a check­point near the City Cham­bers, mem­bers of Protest in Har­mo­ny and street the­atre group Active Inquiry told the sto­ry of the Hebron “High Street” which, since 1994, has been closed to Pales­tini­ans liv­ing in the West Bank of Hebron. With queues, pass­es and “sol­diers”, they act­ed out Shuha­da Street-style apartheid as wit­nessed by San Ghan­ny Choir dur­ing their April 2017 vis­it to Hebron, in the West Bank. Songs of non-vio­lent protest were sung by the choir led by Pen­ny and Shereen. 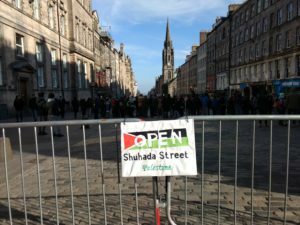 San Ghanny’s thir­teen mem­bers vis­it­ed and sang in Shuha­da Street and were so shocked by the sim­i­lar­i­ty to apartheid they vowed to join the glob­al cam­paign to “Open Shuha­da Street” start­ed by Youth Against Set­tle­ments in Hebron. “It was like the High Street in Edin­burgh being closed to all Scots!” said Sheila Mack­ay. Many peo­ple were involved in the plan­ning of this action includ­ing mak­ing ban­ners, badges, a mock check­point and “pass­es” to hand­out to passers-by. A prepa­ra­tion day had intro­duced us to street the­atre tech­niques and Suzanne Dance had encour­aged us to impro­vise and act out sce­nar­ios to help us feel what it might be like to live on an apartheid street. 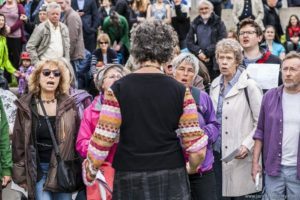 About twen­ty-five choir mem­bers were involved in this suc­cess­ful and enjoy­able action and near­ly four hun­dred explana­to­ry “pass­es” were hand­ed to those who stopped to watch and lis­ten. 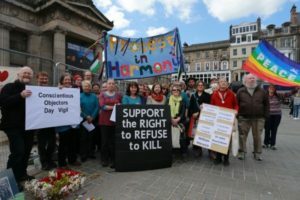 Eileen Karmy made a video of the event which has been shared with Youth Against Set­tle­ments in Hebron and with a cam­paign­ing organ­i­sa­tion in Chile. 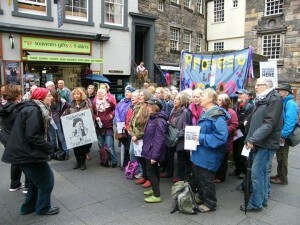 Shereen writes: Many, many thanks to the PiH-ers who turned out ear­li­er this week to sup­port the UCU strikes. It’s been huge­ly appre­ci­at­ed by my col­leagues (and of course by me!). It’s always mov­ing to sing in Greyfri­ars Kirk­yard on Decem­ber 3rd in mem­o­ry of the hor­ren­dous 1984 gas dis­as­ter in India. We stand tucked in, round the cor­ner, near the plaque at the gate­way so vis­i­tors often don’t see us at first. Then we sing. This year it was Think of Me, Step by Step (as a round) Rise Like Lions (but not with­out inci­dent!) Bam­balela and Free­dom Come All Ye. 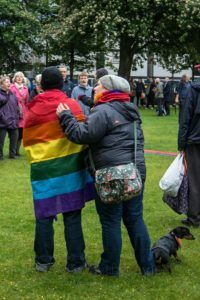 Some­times it’s been in the dark or the rain but this year it was just “nor­mal Scot­tish cold” We, twen­ty-five or so mem­bers of Protest in Har­mo­ny led by Jane and Shereen, three wreath-lay­ers from the Trades Unions and one or two oth­er stal­wart souls lis­tened to Eurig Scan­drett as he spoke of his knowl­edge of Bhopal and the ongo­ing work there. Then he read from Rob Edwards’s 2014 news­pa­per arti­cle. 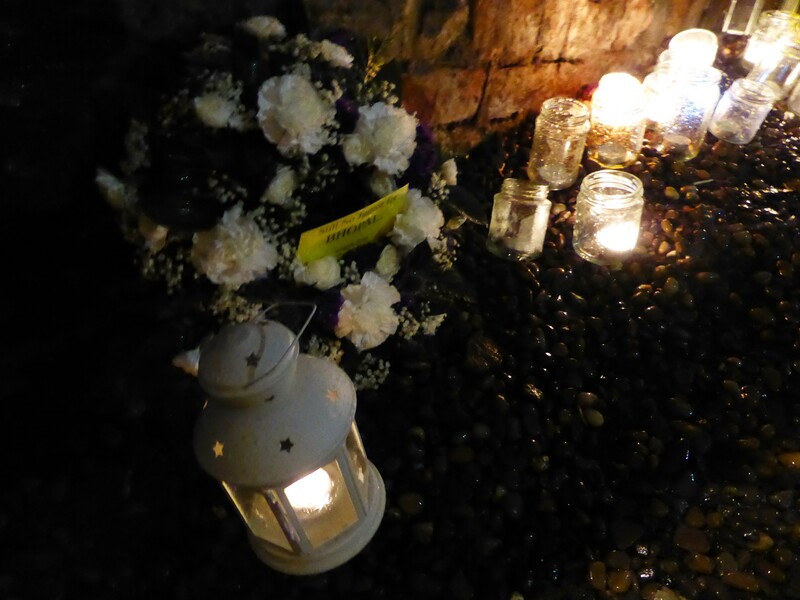 We held a minute’s silence. Peo­ple came and went using the short­cut through the kirk­yard. But a small group stopped to lis­ten and learn about the world’s worst indus­tri­al dis­as­ter. 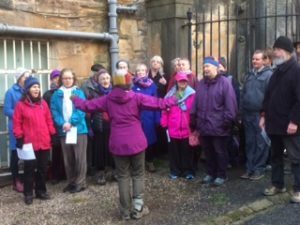 On Sat­ur­day Dec 9, 2017, quite a few of us went out to sing in Rose Street after our last rehearsal of the term. A record amount of mon­ey was col­lect­ed by CAAT. Very suc­cess­ful. Eight or nine mem­bers of PiH went out to Liv­ingston to sup­port them as they chal­lenged the clo­sure of their ser­vices. They sang songs includ­ing Save Our Pub­lic Ser­vices and Bam­balela. 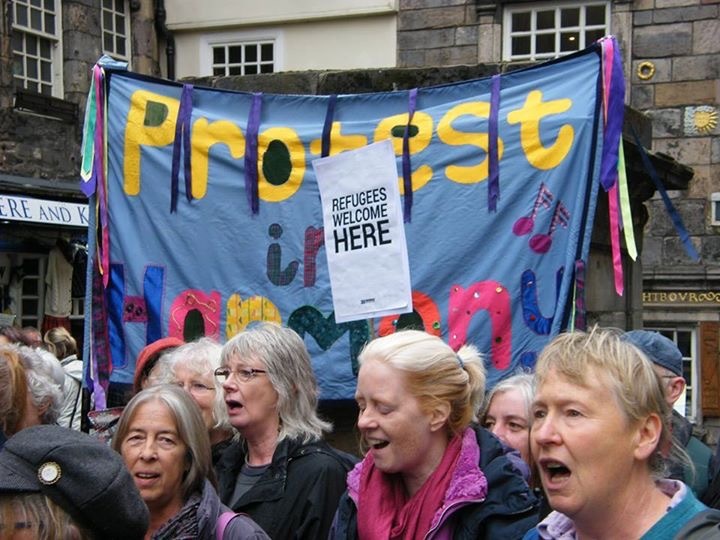 Singing ‘Refugees Are Wel­come Here’ at the Scot­tish Green Par­ty event out­side Par­lia­ment in June to show sup­port for stay­ing in EU just before the Par­lia­men­tary debate. Some of us were able to be at the vig­il on June 15th for the peo­ple whose lives were tak­en in Orlan­do. 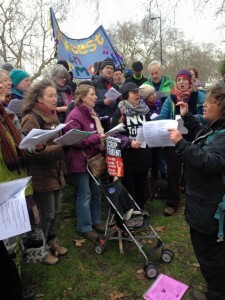 We sang as peo­ple gath­ered. About 70 peo­ple joined the third annu­al Con­sci­en­tious Objec­tors Day vig­il on 15 May to remem­ber the 16,000 COs of the First World War and all those who have refused com­pul­so­ry mil­i­tary ser­vice around the world in the past and today. Mark­ing the cen­te­nary of con­scrip­tion in the First World War we shone par­tic­u­lar­ly remem­bered COs from Edin­burgh and Scot­land who were impris­oned, forced to do hard labour and those who died. We also remem­bered local peace activists who have passed away in the past year, includ­ing Fr Daniel Berri­g­an, an Amer­i­can Jesuit priest whose action with the Catonsville Nine in 1968 sparked anti-war actions and demon­stra­tions that even­tu­al­ly end­ed the Viet­nam War. Speak­ers includ­ed Peace and Jus­tice Cen­tre Coor­di­na­tor Bri­an Larkin, Les­ley Orr from the Iona Com­mu­ni­ty, Eric Chester (IWW), Ari­an­na Andrean­geli­ni, who spoke about Sec­ond World War CO Franz Jag­ger­stadter, and Eliz­a­beth Allen and Andrew Far­rar, descen­dants of First World War COs.
Protest in Har­mo­ny joined in the memo­r­i­al singing songs includ­ing Unsung Heroes, Siya Ham­ba and Here We Are Again. Once more this was a very mov­ing occa­sion. Mem­bers of Protest in Har­mo­ny added their voic­es to the 2016 Edin­burgh May Day march and ral­ly. 2016 May Day was cel­e­brat­ed on Sat­ur­day, 7 May and cel­e­brat­ed work­ers’ rights, human rights and the life of James Con­nol­ly. 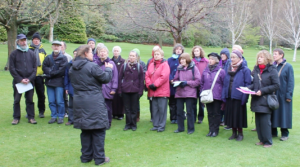 One of our song­lead­ers, Pen­ny Stone, sang at the ral­ly with mem­bers of PIH sup­port­ing from the crowd! 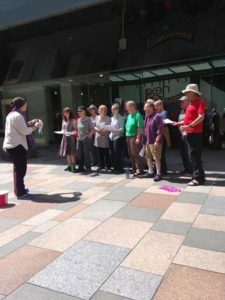 30 choirs, the vast major­i­ty being polit­i­cal­ly engaged, gath­ered for a fab­u­lous con­cert giv­en by local musi­cians and come­di­ans, a great massed sing in Jubilee Square, busk­ing on the streets (includ­ing lusty singing as we strolled past march­ing sol­diers gath­ered for Armed Forces Day), a fan­tas­tic con­cert of all the choirs, and work­shops and a pic­nic the final day. 27 of us had a great week­end of singing, social­is­ing, eat­ing, origa­mi, waltz­ing, Oscars, choco­late spoons and more. It might have been slight­ly chilly, but we soon warmed up thanks to the love­ly food on offer. One of the high­lights, as ever, is the ‘Sat­ur­day Pair­ty’, very ably com­pered by John and the glam­orous Mag­gie who did a ster­ling job with award­ing the choco­late spoon Mof­fat Oscars. 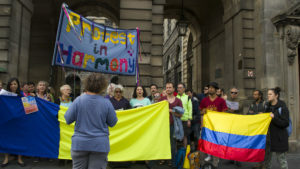 At the end of the evening we were all com­ment­ing on the huge and var­ied tal­ent pool that is Protest in Har­mo­ny. 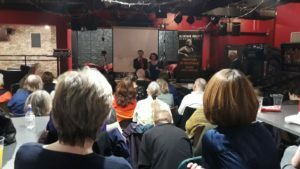 Inter­na­tion­al Work­ers Memo­r­i­al Day is a day to remem­ber those who have died through work to pledge our ongo­ing com­mit­ment to improv­ing work­ing con­di­tions around the world. 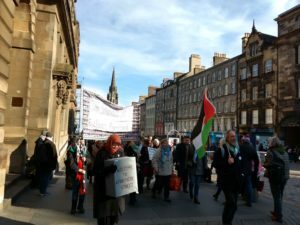 As it does every year, Protest in Har­mo­ny played an impor­tant part in Edinburgh’s 2016 com­mem­o­ra­tion. 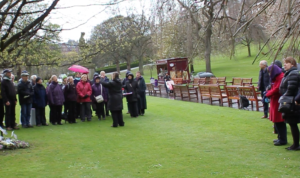 We sang before and after the event on a rainy and cold day at the Work­ers Memo­r­i­al Day tree in Princes Street Gar­dens. Despite the weath­er the event was a mov­ing one, specif­i­cal­ly high­light­ing work-relat­ed men­tal health issues and remem­bered those who have died through sui­cide where work played a part. 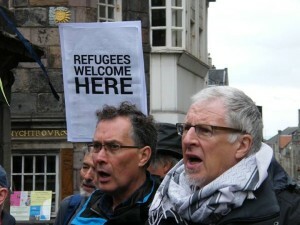 Speak­ers were Paul Holler­an, Nation­al Union of Jour­nal­ists NUJ, Eileen Pen­man, a mem­ber of Protest in Har­mo­ny. telling a per­son­al sto­ry of loss, and Alieu Ceesay, a jour­nal­ist and refugee from the Gam­bia. We sang One Heart Beat­ing, William Mor­ris and Free­dom Come All Ye. 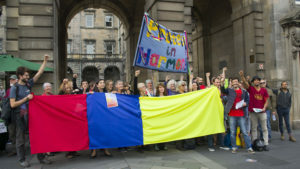 The event was organ­ised by Scot­tish Haz­ards Cam­paign and Edin­burgh TUC. Wreaths laid by UNITE, UNISON, NUJ, UCU, FBU, RISE, Scot­tish Haz­ards and Edin­burgh TUC. At Trafal­gar Square there was a major­i­ty of female speak­ers, includ­ing polit­i­cal lead­ers. 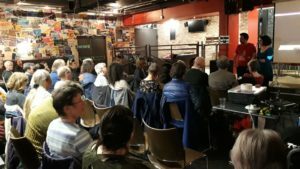 Nico­la Stur­geon made the obvi­ous point that the UK is in a minor­i­ty in hav­ing nuclear weapons. 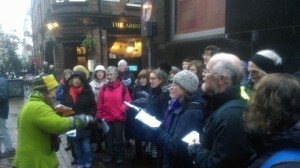 On 12 Decem­ber around 35 of us braved the cold to take part in our annu­al fundrais­ing sing for the Cam­paign against the Arms Trade. 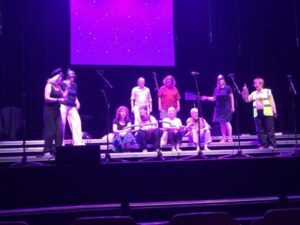 Ably encour­aged by our inspi­ra­tional song lead­ers, we sang a very sat­is­fy­ing med­ley of sea­son­al stan­dards togeth­er with some new and mov­ing songs for Syr­ia and Pales­tine. The Christ­mas shop­pers seemed appre­cia­tive. Sad­ly recent events have made our songs very rel­e­vant this Christ­mas. 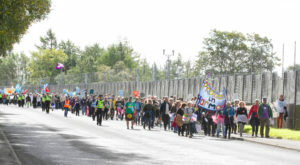 Mem­bers of Protest in Har­mo­ny joined singers from the Open Com­mu­ni­ty Singing Group, Por­to­bel­lo Com­mu­ni­ty Choir and Wild­fire to sing a Sami yoik, We Speak Earth, in sup­port of the Sami com­mu­ni­ty which will be dev­as­tat­ed by the increas­ing effects of cli­mate change. We met togeth­er at Por­to­bel­lo Beach, luck­i­ly in some wel­come sun­shine after days of stormy weath­er, to sing togeth­er and make a sight and sound­bite to share on YouTube on 12th Decem­ber for the Paris Cli­mate Sum­mit 2015. Singing it out­doors on the sand with the sea behind us and the sun shin­ing on us, with the sound of the waves, the gulls and the breeze sur­round­ing us made it all the more enjoy­able and mean­ing­ful. 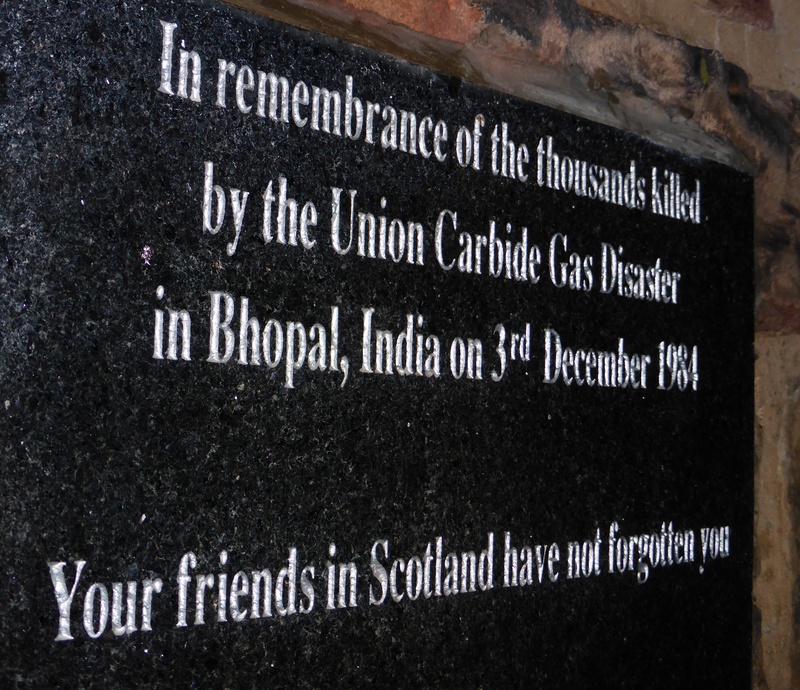 20 peo­ple braved the rain and wind to gath­er at Greyfri­ars Kirk­yard to com­mem­o­rate the 31st anniver­sary of the Bhopal gas dis­as­ter. 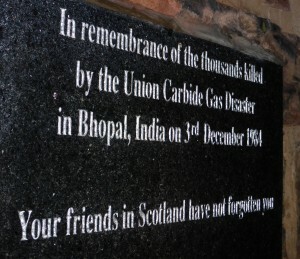 With songs, poet­ry and state­ments of sol­i­dar­i­ty, we remem­bered all those who have died and been made ill in Bhopal and renewed our pledges to sup­port the peo­ple of Bhopal in their ongo­ing strug­gle for health care, clean water and jus­tice.